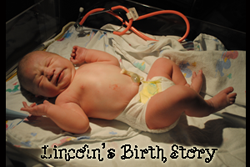 I have some awesome news to report - I have been accepted as a Nuby Mommy Blogger! 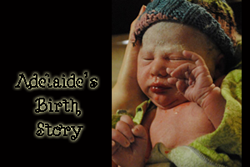 This means that I get to try out some awesome baby and toddler products and share my findings with all of you - and there may even be a fun giveaway from time to time. 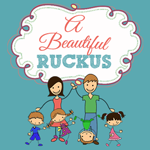 I am definitely smack in the middle of the baby/toddler phase of parenting, and I hope you will enjoy hearing about some of the latest products for little ones on the market today. 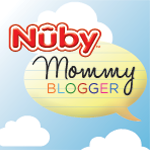 Make sure you are also following my Nuby Mom Pinterest Board to keep up to date with all my new Nuby posts! When your baby turns into a toddler, it's inevitable that one day they will suddenly become fiercely independent and demand to do everything all by themselves. Around here, this has most recently resulted in Lincoln throwing some pretty epic tantrums when we do not let him use a "real" cup or water bottle if he wants whatever we are drinking. Never mind that he doesn't understand how to use a normal cup yet and that he literally dumps water all over himself when given the chance. We have been working on drinking from a real cup, but I don't think he fully understands the concept yet. Enter the Nuby No-Spill Insulated Cool Sipper! 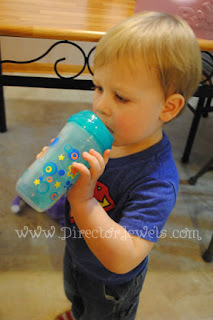 This cup is available in a variety of fun colors and designs - so you can certainly find a special new cup for your toddler boy or girl. The Cool Sipper features a drinking spout that encourages children to learn how to use a real cup. Yay! It's so much easier to teach a toddler a new skill when you have a tool to help them along the way. I didn't have to give Lincoln any encouragement to try out this cup. He saw it in the package, as pictured above, and practically ripped it from my hands. It did take him a few tries to get the hang of the new spout design, but he figured it out all on his own. He loves it - and I love that it has yet to leak at all. If you've been through a sippy cup or two, I'm sure you know that this is kind of a rarity! I am planning to buy several more for our ever-growing sippy cup collection. The cup holds 9oz of liquid. The only downside to this cup is that it is not dishwasher safe. I realize that I should accept that I am a grown-up who can wash a sippy cup by hand every now and then (probably in the same amount of time it would take me to load and unload it from the dishwasher). I love the design of this cup enough that I will use it even if I have to hand-wash it - and that's saying a lot at our house. 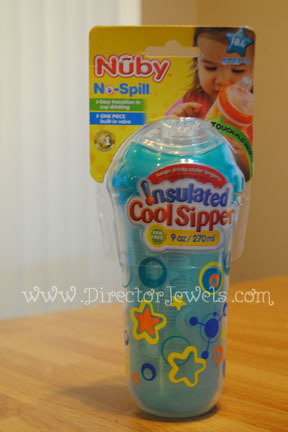 You can purchase the No-Spill Insulated Cool Sipper from Buy Baby Direct, Amazon, Diapers.com, K-mart, Babies R Us, Target, and Wal-Mart. Make sure you follow along with Nuby on Facebook, Twitter, Pinterest, and Instagram to keep up with all the latest products and promotions! I wish they could find a way to make these dishwasher safe. I have several I have to handwash and that gets a bit time consuming every day. My daughter has this cup too, except it has a ballerina on it. She calls it her ballerina milk. :) You are right about toddlers wanting to be independent and this is the perfect cup for that.